"I think there are many worlds operating within contemporary fashion that were previously invisible to me," says designer Hannah Kristina Metz, "the circle I've found myself is one of determined entrepreneurs designing their dream wardrobes." Speaking of which, Hannah's namesake label H.K.M is something of a dream in itself. 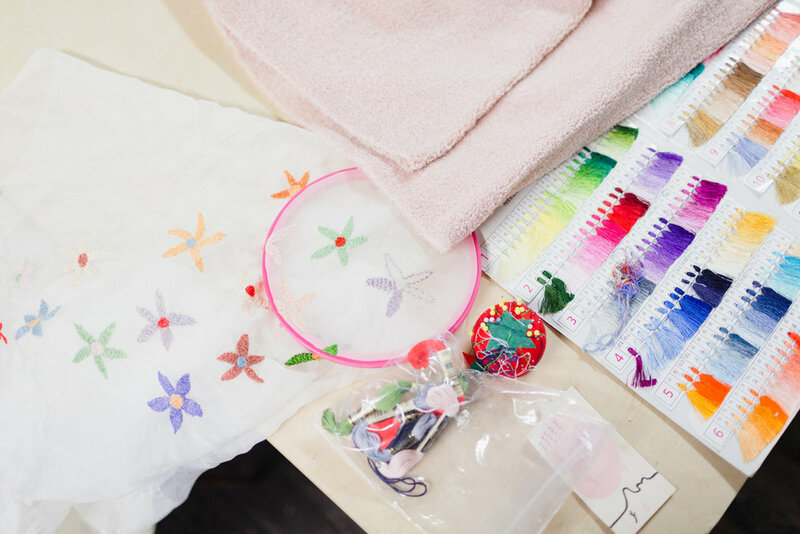 Having become known for her romantic, quirky and feminine aesthetic Hannah's brand infuses both artistry and functionality - something she hopes to establish more of in her collections this year. In fact, we saw this firsthand in our recent visit with the designer who gave us a tour of her Greenpoint design studio. There, we were brought up to speed on Hannah's latest design musings, thoughts on the evolution of contemporary fashion and of course what she plans to assemble daily in the coming months. Enjoy our chat below and also visit The Style Line for an exclusive second part of our interview. My name is Hannah Kristina Metz, I have my own clothing line and I enjoy sharing meals with friends, petting cats and too much TV, really. I value sincerity, comedy, our beautiful planet and equality for all. How did you first connect with Brand Assembly and what do you love most about being part of this community? I had my first trade show experience with Brand Assembly this past season in LA and felt rather spoiled by all the juice, bright sunny venue and the warm people present! It's so far been my only experience with Brand Assembly but it was very positive and I'm grateful to have had the opportunity to explore the world of market week with them! If you had to share your biggest lessons that you've learned what would they be and based on your experience how has your definition of “contemporary” fashion changed? My whole experience thus far has been a series of failures and lessons learned! I think there are many worlds operating within contemporary fashion that were previously invisible to me, the circle I've found myself is one of determined entrepreneurs designing their dream wardrobes. With regard to the business side of the brand how do you manage your time between designing and tending to the not so creative tasks? What advice would you have for fellow designers who are looking to become more immersed in this side of building a brand? At the moment I am a one woman show and still trying to figure out how to best spend my time. Designing is the fastest and most natural part of the process of course, most of my time is spent packing and mailing orders, repeatedly texting my production manager and watching old music videos on Youtube. I'm sorry that's not very helpful! With the start of 2017 do you have any design resolutions for the year (or season) ahead and what can we expect to see in the coming months? I want to push further into the fantastical but wearable, trying to find that sweet spot is my design resolution. I try to draw daily, it's the most therapeutic activity! From those drawings I often find my palette for the following collection and maybe some future patterns too!